Voting in Michigan would undergo a major makeover if Prop 3 passes in November. Among the changes would be guaranteed absentee voting, straight-ticket voting and automatic registration. WHAT IT WOULD DO: Prop 3 enshrines a variety of voting rights in the state constitution. Some are measures Michigan already has in some form: statewide election audits and the right of the U.S. military and overseas voters to receive absentee ballots. The proposal would make those rights harder to change by including them in the constitution. Other parts of Prop 3 would guarantee: the right to vote by straight party ticket, automatic voter registration, same day voter registration and no-reason absentee voting. Yet another is already in the constitution: the right to vote by secret ballot. Bridge Magazine is providing an in-depth look this week at three statewide ballot proposals Michigan voters will decide Nov. 6. Throughout this crucial election year, Bridge and the nonprofit Center for Michigan are providing fact-based, data-driven information to voters about elections for Governor, Attorney General, Secretary of State and state legislative offices. This includes ballot initiatives. Today’s reports, on voting access, are the last of three this week. Who’s funding the fight over recreational marijuana in Michigan? Sample of what you’ll see on your ballot below. WHO'S AGAINST IT: One opposition group, Protect My Vote, was created on Aug. 23. It lists as treasurer Mary Doster, wife of Okemos election law attorney Eric Doster and campaign treasurer for GOP-backed Supreme Court justices. However, its funding isn’t known yet — the group has not yet had to file campaign finance reports with the state. Republican Secretary of State candidate Mary Treder Lang has said she opposes the proposal because same-day voter registration would be an undue burden on clerks on election day. Current Secretary of State Ruth Johnson has said she doesn’t take a position on ballot proposals but that she also opposes same-day registration. BENEFITS: Other states that implemented similar voting reforms have said it has made it easier for citizens to vote and improved voter turnout, according to an analysis from the nonpartisan Citizens Research Council of Michigan. Automatic voter registration would save would-be voters the time and effort it takes to register to vote before heading to the polls, lowering the barrier to voter participation. Studies suggest automatic voter registration in other states led to a boost in voter turnout and could benefit both political parties. It also saves states money on registration costs like data entry, printing and mailing and reduces error in voter rolls. Allowing voters to register on the same day would make voting more convenient and also has been shown to increase voter turnout. Supporters of no-reason absentee voting say it would make it easier for people to cast a ballot without waiting in line or rearranging their schedule. Straight-ticket voting (wherein voters can fill in one bubble to vote for all Republicans or Democrats on the ticket) has a complicated legal history in Michigan. As of now, Michiganders will not be able to vote straight-ticket in 2018, but would be protected by the constitution in future elections if Prop 3 passes. The CRC report says it increases voter participation in the partisan portion of the ballot and reduces the impact of “roll-off,” in which voters stop voting toward the bottom of the ticket. 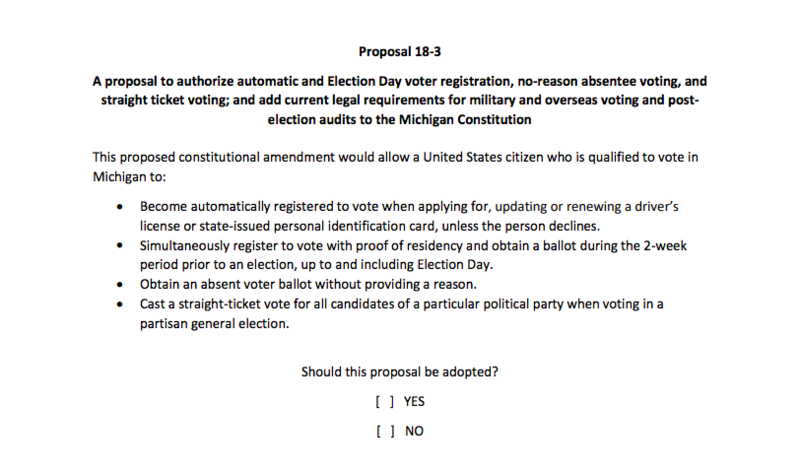 CONCERNS: Opponents of automatic voter registration say the registration process may not effectively filter out non-citizens with Michigan ID cards, which could lead to voter fraud. Similarly, a spokesman for Sec. of State Johnson told Bridge she is concerned that same-day voter registration wouldn’t leave clerks enough time to verify residency, and that it’s not clear what proof of residency would be required under the proposal. However, she does not have an official stance on Prop 3. Opponents of no-reason absentee voting also cite concerns it would lead to voter fraud. According to elections experts, more likely problems are mistakes filling out the ballot — absentee votes more often have errors and are less likely to be counted than those cast in person. Straight-ticket voting is known to benefit Democratic candidates (whose supporters tend to use it more) than Republican candidates, according to the CRC report. The report also notes straight-ticket voting leads to participation decreasing in the nonpartisan portion of the ballot (which would include offices such as local school board and mayor in some cities) and a higher rate of voter errors. DEM. GOVERNOR CANDIDATE GRETCHEN WHITMER’S TAKE: “I will be a yes vote on proposal 3, because it’s too hard to register and to vote in Michigan and, as a result, fewer people do it. Everyone who is approved for a driver’s license or state ID should be automatically registered to vote, and any registered voter should be able to vote absentee or by mail. As a legislator, I fought to ensure valid ballots from our service members overseas were counted, to prevent voters from being turned away at the polls, and to allow same-day voter registration,” Whitmer told Bridge via email. FUN FACT: If Prop 3 passes, Michigan would be the only state in the U.S. to protect same-day voter registration and automatic voter registration in its state constitution (as opposed to in statute). Promote the Vote’s full ballot proposal and their campaign website. The Citizens Research Council of Michigan’s analysis of Prop 3. The state Senate Fiscal Agency's analysis of the fiscal impact of Prop 3 and the House Fiscal Agency's analysis. Where Michigan’s Secretary of State candidates stand on Prop 3. Bridge’s most recent coverage of the Promote the Vote ballot initiative. 1) Straight ticket voting - if you don't know at least the name of the person you're voting for then you shouldn't be voting for them. Our voting system is not intended to perpetuate parties. 2) Same day registration - This puts an enormous burden on poll workers since they have to validate every voter's qualification, all of the ballots cast by same day voters would have to be provisional and if more people started using that process, election results would be challenged more often. It also puts an enormous burden on the Secretary of State who must verify residency BEFORE registering them to vote. Other than those 2 issues, I like it, but because of those 2 issues, I have to vote against it. Vote NO on Proposal 2. Just to be clear, this article was about Prop 3, not 2. I'm no on 3, yes on 2. Vote NO on Prop 3!! I voted early and also no on 3. I agree that absentee voting should be easily available but the same day registration and straight ticket provisions make it easy to say no. Why whoever wrote this included those measures is IMO deceptive. And when they promote this proposal they conveniently avoid mention of those two factors. An important benefit of "same-day registration" is to allow people to vote when they discover on election day that they've been incorrectly removed from the voter rolls. Though a smaller problem in Michigan, this would protect Michigan voters from the "purges" practiced in Ohio, Georgia, Florida, Texas, and other states. A proposal to make voting a less thoughtful, meaningful activity. Giving voting the same significance as walking into a gas station and buying a pack of chewing gum. Is this a good thing? If the polling stations were in gas stations I might agree with you. To search out ones polling station and stand in line should be enough. I have to cut out of work for a period of time to vote and it always takes longer than I would like. No reason absentee voting would give me a tool that helps. I should always be easy to vote. Democracy should be exclusive to the nation not the voter! Where you think voting should be easy, I think voting should be a responsibility that warrants thought and effort. Where you seem to feel that voting should be available on a whim or someone nudging you at the bar, I think it is something we should prize and treat as more important than a campaign card stuck in your hand or a sticker to put on a shirt. Do you think that a voter who just discovered on voting day that it was voting day is likely to make an informed vote or do you not care how informed the voter is? Too many have made the ultimate sacrifice for our right to vote that the voters shouldn't have enough commitment to go to 'City Hall' a week or ten days before election day to register to vote [and where it is easy to request an absentee ballot when you anticipate a work conflict] so the Clerk's office can verify who you are and where you should vote and better ensure that the voting process is not rushed and people can't claim manipulation. Unfortunately for you, the Constitution does not mandate your conceits that voting be thoughtful and effort-full. Though I may agree with you that it's preferable when it is, voting is, in fact, a legal right. Access to it should therefore be made as simple as possible. The easier and later to register only makes more difficult for election officials to ensure voting is accurate and conforms to legal requirements. I suspect you would even like to see registration and voting be opened for at least a week after the results are known so you could recruit people to vote so you could change the results rather then accept the will of the people. My choice is to encourage people to be better informed, yours seems to be about dumbing down voting so people think less and rely more on campaign ads and encourage more spending on campaigns and the use of innuendo than on wanting facts. Your suspicions have nothing to do with fact and are entirely beside the point. My goal is to encourage as many people as possible to exercise their constitutional right to vote as American citizens. This proposal will, in my estimation, go some way toward achieving that. I find it interesting that you speak so cavalierly of "the will of the people," when what you really mean is people who have the time and resources to extensively analyze voting options instead of attending to their basic survival needs. The will of the people is not represented only by you and me and others who are fortunate enough to be able to debate ballot proposals on Bridgemi. It includes a lot of others, and they, too, have a voice, a vote, and a right to be heard. We've seen the consequences of a small percentage of the populace making decisions in their own self-interest that affect everyone. I, for one, would like to see if we can do a little better. Where you seem to feel that voting is about convenience, I see voting as a responsibility. As I mentioned we should measure the value of voting by what people have sacrificed to make it possible for us to vote, to make our will known. As I believe that former President Obama said, 'Elections have consequence.' But for that to be true we need people to honor the will of those who voted. This is not happening, the efforts to undermine the voting and the 'will of the people' has become most blatant since the 2016 election, it started with the Democrats calling for the impeachment of the President elect that day after the polls closed. And that has heighten the call for changing the voting with the justification of making more convenient and yet we see no one being denied access to voting only that they register and vote in a timely manner to allow reasonable processing by the community Clerks responsible for ensuring a proper and legal voting. Your approach is based on convenience of getting people to register and vote with no time to consider what they are voting on. You offer no consideration for ensuring the legitimacy of voter, no concern for those responsible for the election process, no thought for how you are demeaning those who are thoughtful and make an effort to learn about who or what they are voting on. Even your suggestion that small percentage of voters decide issue seem to under cut the proposal to replace Elected official with non elected, non accountable group whose purpose is to design districts that will only be decided by small percentages of voters. If you truly cared about the quality of voting and encouraging people to vote, you would be suggesting ways to help voters become better informed, making access to such information simpler, offering ideas to make ballot porposals clearer and include a description of the purpose of the proposal in the language of what people are voting on so the regulations/protocols and the people that administer them could be held accountable. Your effort is for a person that has never voted to be able to show up at the last possible more and demand to be registered and vote. Who is paying for the proposal (ah yes, the Democrats [those not willing to accept the 'will of the people']) and other out of state [Californian] organizations. It seem what you want is so organizations could watch the interviews of voters leaving the polls to decide whether they should start trolling for people with little interest in the election that could be entice to give and hour or less to register and vote. You seem to see votes as cheap throw away actions where I believe voting is both a most valuable action and one of great personal responsibility. I look at our voting as a foundation block of liberty and you seem to see it as nothing more than an inconvenience that needs to be overcome. Will some of Prop 3's measures complicate the jobs of elections officials? Yes. Is that an acceptable risk if it leads to more people being able to exercise their constitutional voting rights? Yes. I find it interesting that you seem to feel your vote should matter more than other people's. That isn't how it works. I could surmise that you're afraid to see more people voting because you're likely to lose on preferred policy positions if they do. Be that as it may, you certainly have a right to your opinions. Prop 3 will be voted on in this election without the provisions it seeks to subsequently enshrine into law. Therefore, if it passes, it will have met your test for being passed by people who had plenty of time to analyze and consider its provisions, and who decided after doing so that it was good law. You have every right in the meantime to advocate for its failure. We'll see what happens in November. I, for one, believe that voting is too important to be left to the voting elites, and that our country is ill-served when it is. Consequently, I devoutly hope your advocacy fails. I think we and our constitutional rights will be far better off in the long run. Tim where does it say that voting should be as easy as absolutely possible? I read it over again can't find that said anywhere. Maybe you have the wrong constitution? It would be of interest to your readers to hear from Green Party Gubernatorial candidate Jennifer Kurland on this issue. Please, don't forget about the other parties involved in the election. "No-reason absent voting" has the benefit of allowing a voter to spend up to 6 weeks reviewing the ballot choices, researching the candidates and proposals, and making an informed choice. Republicans used the "informed voter" rationale to argue against straight-ticket voting -- that same rationale demands that voters have as much time as we can give them (certainly more than 5-10 minutes in a voting booth) to become informed. Turning "election day" into "election month" through our existing absent voting process certainly leads to the informed voters Republicans long for. As to the "voter mistakes" on absent voter ballots: clerks could validate an AV ballot when it is received (rather than wait for election day) and notify the voter if a ballot is invalid. This would allow the voter to submit a corrected ballot. "No reason" absentee voting makes sense because our voting dates are totally outdated. I can't think of an advanced country that votes on a work day. This is a hangover from agricultural days and since the legislators will not change it, this makes sense as it allows people who work long hours to vote without a lot of hassle. I gather that you haven't heard of 365/24/7, there are people working around the clock everyday of the week, so when wouldn't a voting day be on a work day. You think it 'is a hangover from agricultural days', for your information 'agriculture' is still a significant part of Michigan business, and all of the 24/7 workplaces [you do realize even Meijer is 24/7], and if you add in all the family activities [have you ever had a child serious about their extra curricular activities, sports, dance, even academics] everyday is busy and no day is just laying back trying to figure out what to do to get off the couch. As for me I do my ballot considerations before entering the voting booth, so my time at the precinct polling place is brief. You are thinking that voters will only become informed while they're sitting in the voting booth? Remember that less than half of all voters can name their Senators and US Rep, Governor or Vice President or identify their party! My hunch is that's the reason Democrats want straight ticket voting! How many people really "research" candidates, proposals etc? I think people have this idea that the average person actually does this but I seriously doubt they do. Most people just get their opinions from TV ads etc. It's telling which party continually campaigns against making voting easier, against making districting less partisan. Almost as if the GOP relies on suppression and low turnout to stay in power. And isn't interesting as well that Democrats know that without straight ticket voting their voters would never make it through the ballot? Straight ticket voting helped Michigan Republicans in 2016 because Trump was on the ballot; it cuts both ways. On the flip side, opening more voting booths in urban areas would lessen the need for straight ticket, but Republicans will never do that because it costs money and because it will encourage black voter turnout. So Bones, if it cuts both ways what's the difference? Get rid of it. There's no mention or constitutional requirement to give political parties such a benefit. Isn't it your wish to dampen down the partisanship? Are you really insinuating that black people can't or aren't interested enough to make it through the ballot while white people are? It would be nice if once (just once) you could argue in good faith. Many urban areas in Michigan (typically minority neighborhoods) have an insufficient number of voting stations relative to the number of voters. Combined with the lengthy Michigan ballot (seriously, I consider myself well informed and it took me two hours of research for the local sections of my absentee ballot), this creates a bottleneck at the polls leading to long lines. If you're a working person with a family, the prospect of waiting two hours in line to vote becomes a cost benefit analysis that has been shown to discourage voters (again, often in poor and minority communities). You haven't offered a non-partisan argument against Prop 3, because you know there isn't one and you're comfortable with the voter suppression caused by the status quo. Bones stay on topic. You were arguing the merits of straight ticket voting, then you abandon that and switch to location and numbers of voting stations and ballot layout?, which this proposal has nothing to do with. But you are kind of correct in that I find the voter turn out to be completely irrelevant to anything. As in economics (and probably most things) the majority is always wrong! If someone cannot (will not) take the time to educate themselves regarding who and what is on the ballot, they certainly won't be able to do it at the last minute. What will the "solution" be when they claim that they made the wrong choice on election day? And has anyone been able to provide even ONE example of someone who hasn't been able to get an AV ballot? This argument gets trotted out constantly, yet always fails to show us anyone who wasn't able to get one. I'm voting No as I don't like the idea of same day registration being written into the State Constitution. For one thing, it is too much of a burden to put on the election clerks that are there. Not to mention the time and delays that inevitably would transpire. Secondly - I've heard the argument about people being placed in the wrong district after moving - if the balance of this proposal were to become law, then wouldn't they have days, or even weeks, to verify their residence and their voter eligibility? Why would same day registration even need to be part of this? I'm not a conspiracy theorist, but it sure would open the door for potential fraud. Take that out and I'm a solid YES - but with it - I'm a big No. My wife has been solicited to register and vote, while she does not because she is not legally allowed to as a non-citizen immigrant who holds a Michigan driver's license. Whitmer writes "Everyone who is approved for a driver’s license or state ID should be automatically registered to vote, and any registered voter should be able to vote absentee or by mail." "Same-day-registration" protects voters who arrive at the polls only to discover that their voter registration has been suspended or cancelled or otherwise invalidated. It would allow a voter in that circumstance to demonstrate their eligibility, correct the record, and proceed to cast a ballot. Without "same-day-registration", that voter would still be able to fix the problem but their opportunity to vote that day would be lost. Laws like proposal 3 are only needed because people have behaved badly in the past or elsewhere. There is a history of incorrect voter deletion and purges in recent elections (since at least the 2000 election) which left thousands of voters out of the elections. These past problems warn us that new protections, like proposal 3, are required to safeguard the voters. In the same way, and for the same reason - because people have behaved badly in the past - these protections must be constitutionally protected. We have in Michigan a history of legislatures behaving badly, running fake candidates in the opposing party's primary, appending token appropriations to bills to prevent voter referendums, reintroducing and passing (with anti-referendum provisions) laws that the voters had repealed, undercutting voter initiatives by repealing the referenced law and by passing a law with the intent of keeping it off the ballot and invalidating it after the election, and more. Placing the law in the constitution is only necessary because the legislature cannot be trusted to adhere to what the people of Michigan choose. This proposal is a hodgepodge of "solutions" for partisan complaints. Straight ticket voting isn't a benefit for the voters. That is unless the clerk has done a lousy job of staffing or making voters informed of what the choices are. Instant registration for the supposed purging is fear mongering. About the only valid item in the proposal is the ability to ask for an absentee ballot. But that all this is packaged together just makes it that much easier to reject the entire thing. I would support the absentee ballot stuff but not at the price of straight ticket voting. This whole proposal will no doubt end up in the courts even if it passes. It is poorly written and lacks a cohesive reason. About the only benefits will be to the lawyers who argue this nonsense. A guaranteed drain on resources. Vote no and tell those who started this nonsense to get their act together.